UMNO social engineering: Poor Indian students have to beg for even exercise, revision and workbooks, stationary, uniform and food. Why should the Indian poor children be begging for even basic necessities when prosperous Malay-sia can afford the world’s tallest Twin Towers! This sum was forwarded to our HQ in Bangsar yesterday evening (25/4/11) and has accordingly been banked in to the HRP bank account. According to Mr. Bala of Geneva, this money was collected after a luncheon meeting of local native Swiss at Geneva who were moved to make a contribution as Geneva is the world centre for the protection and preservation of Human Rights. More important than this cash contribution is the creation of awareness in Geneva on the gross UMNO racism targeted against the Malaysian Indian poor. HRP registration suit: Absolute power “Tuan” A.G Gani Patail neglects coming to court and gets away with above the law mindset, to prevent HRP championing Indian poor cause. This morning P. Uthayakumar represented himself as the Applicant at the Kuala Lumpur High Court before Yang Arif Dato Rohana binti Yusof in the civil suit for a Writ of Certiorari and Mandamus to compel the Registration of the Human Rights Party (HRP) as a legal political party in Prime Minister Najib Razak’s One Malay-sia. 1. Technically HRP has been denied legal registration as a political party for twelve (12) years now beginning from the 2000 when P. Uthayakumar had submitted the Registration of Parti Reformasi Insan Malaysia (PRIM). 2. Thereafter on 18/6/2009 we had written in to the Registrar of Societies for the approval of HRP as political party but the Registrar of Societies RO has refused to reply. 3. 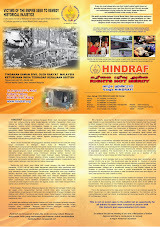 On 25/11/2011 we submitted the full application forms as was required by the ROS but again they refuse to approve HRP. 4. Three letters of demand to ROS dated 17/12/10, 17/2/2011 and 14/3/2011 were refused to be replied despite we saying we will go to Court. This is the UMNO ROS’ above the law mindset. 5. And this morning even the (mighty almost absolute power wielding Attorney General Tan Sri Gani Patail’s) Federal Counsel “Tuan” Noor Hisham bin Ismail, the Head of the Construction and Administration Unit at Putrajaya refused to attend Court despite having been served the cause papers on 204/2011. 6. Another Federal Counsel Puan Aidha binti Abu Bakar who happened to be in court on another matter made frantic phone calls to the “Tuan”. (The Malay muslim Court Interpreter “helped” by pushing our case to the last case). 7. Suddenly Puan Aida not the Senior federal counsel in conduct of this case barged into the Judge’s Chambers panting away and informed (lied to) the Court that as they had not received some of the documents she is asking for another date. 8. When Uthayakumar asked what document was not served on the A.G’s Chambers she had no reply. 9. P. Uthayakumar further submitted that if at all they had not received some of the documents (which is denied as they had acknowledged with their rubber stamp having received all the cause papers) they should have written in to us which they have not. 10. And in any even the “Tuan” should have been present in Court to explain to Court. 12. Uthayakumar had further submitted to Court that this is an ex parte (one party) application according to Order 53 (3) (2) of the Rules of the High Court and that according to the Order 53 (3) (3) it only require us to serve and notify the A.G’s Chambers which we have done. 13. And that once leave is granted the AG can contest the same at the inter parte (both parties stage) if he wants to. Be that as it may the Judge, a Malay-sian Judge as usual looked to the Federal Counsel for “directions” and adjourned the matter to the 6th May 2011. “Justice must not only be done but must manifestedly and undoubtedly be seen to be done! This is at least what we studied at first year law school. But which will be seen at the final verdict as to whether HRP would be registered as a political party when no other political party has had it’s registration rejected ever before and that the record stands that there are 21 registered political parties in One Malay-sia, with the tallest pro UMNO/BN MMSP and KLIA getting their registration approved within 2 weeks and one month respectively by the One Malay-sian Prime Minister Najib Razak and his Home Minister Kerismuddin.